One of two additional views of the jug. The opposite side of the jug. 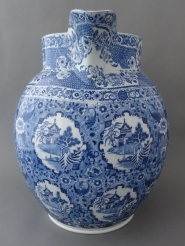 A large earthenware bath jug printed in blue with a variation of the Net Pattern. This piece is unmarked. Earlier versions of the Net pattern are known to have been made by at least three manufactories: Spode, Herculaneum and Job Ridgway. Another potter with the initials C. T. is also said to have made the pattern. 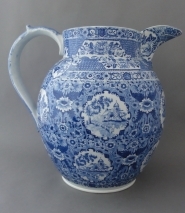 One of the medallions seen on this jug, shown here on the side of the jug, is different from the four landscape designs found on the earlier versions of the Net Pattern. A Western influence is apparent in this pattern as seen in the cottage-like building and by the placement of a cross on top of the building's tower in the medallion. The second medallion is similar to one found in the earlier patterns of the same name and it is repeated in the border. The two alternating medallion designs are surrounded by an all-over floral pattern. Absent in this example is the center net design from which the pattern derived its name.